News of upcoming releases which have been covered on the site are best found by doing a search (USE THE SEARCH BOX ON THE HOME PAGE). DTB now has TWO online stores. DTBOnline store is our original shop and lists over 800 items relating to the band and musicians, including of course CD and vinyl, as well as printed material, and of course stocks of the original printed magazine. 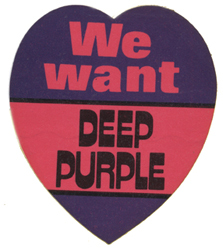 We have also just launched (July 2014) our new Deep Purple Collector’s store. For some time we have issued a printed list of collectables as an email attachment, but have decided to more to an online store instead. The store will sell new and used rare vinyl, CDs, printed memorabilia, posters, tapes, tickets, and lots more. Most of the items in the store are one-offs. DTB also offer a mailing list service, and if you join this you will receive updates by email once a month or so detailing what’s coming up, and also other news, special offers and pre-order information. You can also download the latest 4 page update catalogue as a PDF on the site. Darker Than Blue began a mail-order operation back in the late 1970s, serving readers and subscribers in a small way with back-issues, books, posters and other material. Today we have an online store – Darker Than Blue Online Store – with over 800 products all related to Deep Purple and associated musicians. We also try to keep in stock of deleted editions and limited edition vinyl pressings. Fans can shop online using our secure services, or browse the catalogue online but order more conventionally over the phone or by post. We are also often able to answer questions on orders via the phone during our business hours or by email. We cannot deal with problems if you purchased CDs from other retailers! Using the store helps keep the website and blog going and supports our other projects, and we’re always on hand to answer questions and sort problems out. We currently do NOT have a FULL printed catalogue but we do issue a 4 page new and forthcoming catalogue which is sent with all new orders. This is updated weekly. Forthcoming items can be pre-ordered and we always do our best to get a good price (and prices all INCLUDE post and shipping – see next paragraph!) on new releases and pass these discounts on. You can download a PDF of this 4 page catalogue from the site here. “Where are all the mail-order dealers who used to advertise in the back of Record Collector?” bemoaned one fan we spoke to on the phone recently. Simple, they’re out of business thanks to Amazon’s targeting of all competition. Run at a massive loss for years (to enable them to undercut properly run businesses), aggressively avoiding paying taxes by channeling profits through tax havens, forcing suppliers to work to impossible margins, demanding ever bigger discounts which make many projects unviable, treating warehouse workers poorly, ordering large amounts of stock to keep other suppliers short, and now trying to demand the right to print books themselves if suppliers don’t send them enough, if you want to support this business model then kiss all independent shops online and on the high-street goodbye. You might save a few bob today (though in fact they’re not always the cheapest as many of our customers have discovered!) but we’re all paying for it in the way titles are now regularly deleted in double quick time. DTB operates in the UK, pays VAT and all other UK taxes and is always available to talk about orders, discuss releases and sort any problems out. The heart shape? This was a sticker sold in newsagents back around 1972, alongside a lot of then trendy bands like T.Rex and Slade! From the DTB Archives.